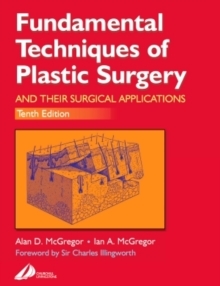 The 10th edition of Fundamental Techniques of Plastic Surgery provides a straightforward account of the principles and practice of the basic techniques of plastic and reconstructive surgery that every surgeon should know. The management, repair and reconstruction of defects and wounds using skin and other tissues are discussed in detail, and potential problems and complications are also reviewed.Complete coverage of all key plastic and reconstructive surgery techniques needed by all trainee surgeons. Outstanding illustrations support straightforward, step-by-step descriptions of all techniques.Written by experts with clarity and simplicity, in an easy-to-use format. Brand-new section on osseointegration of the nose and ears prior to prosthetic treatment. Brand-new section on pelvic reconstruction following colorectal, urological and gynaecological malignancy.Moreon radiation injuries after radiotherapy. Moreon the use of the gracilis and myocutaneous flaps.Expandedlasers section to include resurfacing, treatment of pigmented lesions and tattoos. Increasedcoverage of chemical vs surgical wound debridement prior to surgery.